Most colorists are either marker people or colored pencil people and are very passionate about their chosen favorites. We have already talked in detail about colored pencils here… so now we will dig into the best options for markers to use in your chosen adult coloring books. Markers do limit which books you can work in, at least to the extent of them being double-sided but on the other hand, if you love Johanna Basford books you can always buy two copies and use markers on one side of the pages and then the other. So go for it! The only bigger sized markers that I have found that don’t bleed through nicer quality paper are the Faber-Castell line of Pitt Pens. Peta Hewitt has a tutorial video showing using them with the colored pencil underneath as a protective quality but I’ve found at least in Johanna Basford, Hanna Karlzon, Millie Marotta quality coloring books you can use them without any colored pencil underneath. Of course, always do a test swatch in the back of the book. You can see in my Enchanted Forest owl coloring here that the black is clear although a bit splotchy in the bigger areas. Zoomed in it shows up but casually going through the book it looks great. I did this one with a small Pitt pen for around the tiny details and then with the Big Brush Artists Pen for the large areas. But of course it is more economical to buy a pack of them and with Faber Castell, you have quite a few options. PITT artist pens contain pigmented India ink which is archival – acid-free + Smudge-proof and waterproof when dry! Faber Castell Pitt Pens Basic’s 6 Pack includes Pink Carmine, Dark Chrome Yellow, Manganese Violet, Phthalo Blue, Permanent Green Olive, Cadmium Yellow. Faber-Castell Pitt Pens Basics Pastel 6 Pack includes Light Yellow Glaze, Light Phthalo Green, Ice Blue, Pink Madder Lake, Lilac and Cold Grey. Also available is the Six Shades of Blue Faber Castle Brush pen Set and the SUPER yummy Metallic Pitt Pens here. The first box set is a set of 12 including Cadmium Yellow, Phthalo Blue, Leaf Green, Orange Glaze, Pale Geranium Lake, Middle Purple Pink, Purple Violet, Sky Blue, Caput Mortuum, Black, Cold Grey III, and Dark Phthalo Green. Faber-Castel Pitt Artist Brush Pens 48 Pack – These come with a really nice case as well. These types of artist pens need to be stored horizontally not vertically like a gel pen. See the example pictured here. This is a pretty sweet setup for the price for the gorgeous artist grade markers that don’t bleed through! Faber-Castell is marketing the Pitt Pens and BIG Brush Pitt Pens to stampers now in smaller sets so if you have a Michaels near you that carries them, use your 40% off coupon to snag them up. Sets of 3 come in Blue, Red, Yellow, Green, and Neutral. There is a gift box set of the BIG Brush Pitt Pen Markers with 15 colors. It says it’s for stampers but these are Pitt Pens at a decent price. There is also a small set of the BIG Brush Pitt Markers Colors include Black, Cadmium yellow, Indanthrene blue, Phthalo blue, Pink carmine, Cold gray III, Caput mortum, Leaf green, Orange glaze, Middle purple pink, Purple violet, Dark phthalo green. The other thing that I DO really love about these pens is that you will recognize the names of the colors as being the same colors that are in your set of Polychromos Colored Pencils. Johanna Basford recommends Staedler and Stabilo 88 markers. Neither of these will bleed in her books which make them a favorite of mine. I have not yet mastered coloring with markers and so far prefer to use colored pencils in combination with these fine line markers and Gelly Roll Glitter or Metallic Pens. Triplus Staedtler Fine Line Markers – I adore these markers and just wish they came in more colors. The 20 marker pack has a cool stand-up case which is perfect if you like to take your coloring with you, but next time I will get the 36 pack and just take my favorite colors with me. That part will be your hardest decision because if you like coloring in coloring books with two-sided pages you NEED to buy these markers. This is the smaller set of 20 Staedtler selection of colors with the portable stand up case. Stabilo ultra fine point liners are the other option that works well for double-sided coloring pages and the retro look of #2 pencils is kind of fun too. You can even leave the caps off of these and they won’t dry out. A small family owned company sent me their pens to test and they are similar to a Pentel or Flair pen as far as coverage but have little to no bleed through on average coloring book pages! It looks like these are a new product launch, but if you do see these while shopping they were quite nice to use. Liqui-Mark a leading manufacturer of writing instruments & school supplies for 41 years has launched their Color Therapy™ Brand of Adult Coloring Markers. Available in 16 classic and fashion colors. First available at Five below retail stores and soon many others including Amazon. These are also made in the USA! You can click here for more info. This designation goes to Copic Markers. They are artist grade, refillable, with replaceable nibs, compatible with an airbrush system and come in every color of the rainbow including a large selection of neutrals for coloring people. Copic’s are alcohol-based, permanent and non-toxic and dry acid-free for scrapbook and keepsake use. Refillable – Once you purchase a marker, it is yours for life. By simply refilling the marker and replacing damaged nibs, your marker will last a lifetime. Some artists have been using the same markers for almost 25 years. Dependability – Copic markers will not dry out when not in use. With a guaranteed 3-year shelf life, your investment will not waste away in storage. Quality Tested – Each marker is hand-tested for overall quality and color consistency three times before it is shipped from Japan. Replaceable Nibs – Accidentally let the kids mess with your GOOD markers? They aren’t ruined.. just buy new nibs and they are like new again. Super Brush Nib – This unique, flexible brush allows for smooth blends and paint-like application. No other brush marker on the market has the feel and quality of the Super Brush nib. 385 COLORS! If you can never find just the right color, Copic’s have it. Along with the amazing markers comes a high price, so these are for the colorist who enjoys markers and wants the best of the best in colors, blendability, and permanence. The UK has been addicted to Coloring books long before they picked up popularity in the US and there seems to be a better variety with better pricing on the markers there. Warning.. this might make you drool! A trunk filled with all 385 colors of Copic Markers. OH MY! The step down from Copic are the Prismacolor artist grade markers. 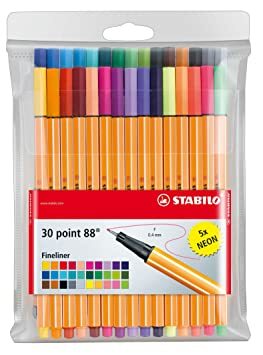 The price on these is quite a bit lower but there aren’t as many colors (200), they aren’t refillable and the nibs aren’t replaceable so you just have to decide which is best for your use. Prismacolor Premier Double-Ended Art Markers. Designed for detailed work and feature an advanced dye-based alcohol ink formulation that ensures rich color saturation and coverage, and smooth, silky ink flow. You have three options for the Nibs: Brush, Chisel, and Fine Point. For coloring, I haven’t found much use for the chisel as it’s too big for most coloring books but if you will use the markers for other art then those might work just fine for you. You will notice that the storage for markers shows them being stored horizontally and that IS THE BEST WAY to store them particularly double ended ones. If you store them in a pencil jar the nibs will wear out or dry out and it just isn’t recommended. I have been using these “Zig” markers for years in my scrapbooking which is why I always tell people to check their craft room for markers and pencils before they buy any because you might have already bought a stash you forgot about. These pens have some fans that like them as well as Copics and you can see the price is MUCH more affordable. All three of these have a colorless blender pen that is a huge part of their systems for blending colors together. The Kuretake pens can be blended with water and used like a watercolor brush. Kuretake – Zig pens come in many nib styles, brush, fine line, calligraphy and more. Zig also makes the wonderful “Wink of Stella” that everyone is raving about. It’s a glitter marker that comes in either clear or colors. Be sure to watch a video of how to use them before you take them back to the store … that’s what happened to me. You have to “Activate” them but once you do that they give you a lovely glitter effect over any area you have colored in. Set of 36 Vivid, water-based ink colors for a variety of applications. Durable fiber tip produces fine lines. The Generous ink supply is excellent for coloring. Snap-fit cap prevents the tip from drying out. Ideal for artists, designers, students, and children. Colors include: Baby blue, Beige, Black, Blue, brown, Carmine, Coral pink, Dark brown, Dark grey, Dark green, Dark red, Dull orange, Emerald green, Gold ochre, Grayish green, Green, Heliotrope, Lemon Yellow, Light gray, Light green, Magenta, Marine blue, Ochre, Olive green, Orange, Pale orange, Pink, Prussian blue, Ram uber, Red, Silver gray, Sky blue, Steel blue, Turquoise, Violet and Yellow. You can watch for these pens to go on special along with new colors being released every so often. This pack of 20 has all the basic colors. Sharpies are of course the least expensive markers around and everyone probably has several already floating around their house. These do bleed so if you want to use them be sure to put at least one piece of scratch paper behind your project to protect the rest of the book. Best Colored Pencils to Use for Adult Coloring Books if you want to explore watercolors in coloring book we have great tips for you here. This is an exhaustive list of pens I have personally used, if you have other favorites please let us know via social media. There are book deals to explore on Dover / Creative Haven Books and Book Depository.